It should go without saying that winter in Canada is cold. 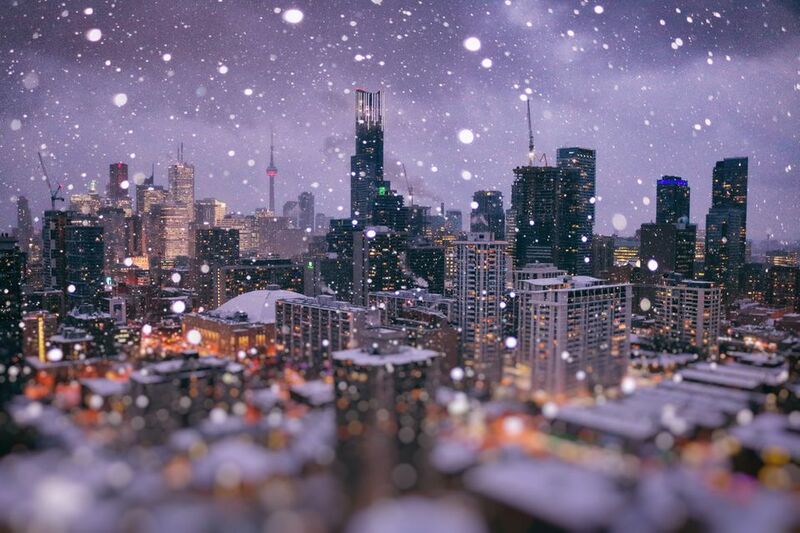 Toronto, Ontario, is colder than New York City, but not quite as cold as Montreal or Ottawa. Its temperatures are much like Chicago, Illinois. But like anything, the more prepared you are, the better off you are. So pack correctly, know what to expect, and reap the great bargains to be had if you travel to Toronto in February. Do not underestimate how cold it can get in Toronto in February. The average temperature is 23 degrees Fahrenheit (-5 degrees Celsius). Non-freezing days are possible, but people—especially kids—who are ill-prepared for wet, cold conditions will likely be uncomfortable. You may also get snow in February. And, if you do get snow, the walkways and roads may be slippery and hazardous. When it is very snowy or slick, then you may have additional transportation challenges, such as canceled or delayed flights or slower public transit. Packing for warmth is key when it comes to being comfortable in Toronto in February. You don’t want to underestimate the power of the wind to bite through thinner layers. In order to keep your body warm in winter, layering will be a big help. Pack warm, waterproof clothing, including sweaters, hoodies, a heavy jacket, hat, scarf, gloves, and insulated waterproof boots with a non-slip sole. Despite the chillier temperatures, there are still quite a few fun and interesting events happening in Toronto in February that cover everything from food to art. Do note that some of the events happen outdoors, so make sure to bundle up. Winterlicious: From the end of January to the beginning of February you can experience Winterlicious, a series of culinary events and the ever-popular prix fixe promotion at more than 200 participating top Toronto restaurants. For 2019, this food-focused event runs from January 25 to February 7. Toronto Light Festival: Toronto's historic Distillery District is transformed into a whimsical and breathtaking light show featuring thousands of lights throughout the Distillery as well as art installations. See the light fest from January 18 to March 3, 2019. Winter at Ontario Place: Ontario Place helps make winter a little more enjoyable with this new festival offering skating, a bonfire, winter light exhibition and more. For 2019, the fest runs through to March 17 and admission is free. Bloor-Yorkville Icefest: Ice sculptures come to the neighbourhood with carving demonstrations, competitions and plenty of photo ops. For 2019, Icefest is happening February 9 to 10. Harbourfront Centre: This cultural hub of Toronto offers special artistic and cultural events throughout the year. From November to March, you can ice skate for free on Canada's largest artificially-frozen outdoor rink. The rink is set along the beautiful shoreline of Lake Ontario and is the city's most scenic rink. Wintertime is prime time to go for a skate at the rink at Nathan Philips Square in downtown Toronto. Skate rentals are available and you'll find food and drink concessions close by. February is low season for visitors to Toronto, so lots of hotels offer great deals and good theater tickets may be more plentiful. If you like winter activities like snowshoeing, ice skating, or skiing, then February may be one of the best times for you to visit. Toronto is home to many outdoor skating rinks and you can find opportunities to ski and snowboard not far from the city. You may want to avoid popular attractions or ski lodges on the third Monday of February. That day is a holiday called Family Day. Ski resorts may get crowded and you might experience greater than usual waits for ski lifts. The Eaton Center is one of many indoor shopping malls and connects to Toronto's underground "path" of shops. PATH, the largest underground shopping center in the world, is an 18-mile network of underground pedestrian tunnels and walkways connecting the office towers of downtown Toronto and four million-square-feet of retail space. To learn more about when the best times to travel to Toronto are, check out our guide on the best time to visit.